Isaac Harris will join the Department of Mathematics as a new tenure-track assistant professor in August 2018. 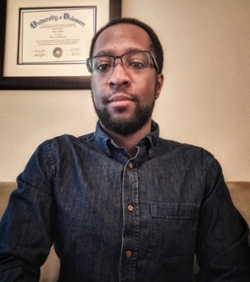 A native of New Jersey, Professor Harris was a McNair and LSAMP scholar at Kean University, where he graduated with honors. He received his PhD in Applied Mathematics at the University of Delaware under the direction of Fioralba Cakoni. During his time as a graduate student, he also spent a summer at the Ecole Polytechnique in Palaiseau, France, where he studied transmission eigenvalues and their relationship to certain material properties. For the past three years, Professor Harris has been a Postdoctoral Visiting Professor at Texas A&M University under the direction of William Rundell. In 2016, Isaac was invited to the Oberwolfach Research Institute for Mathematics as a Junior US Fellow. Professor Harris's main research interests are in direct and inverse problems for partial differential equations, specifically those arising in acoustic and electromagnetic scattering. These problems are frequently found in medical and engineering applications of non-destructive testing, where physical measurements on the surface of an object are used to infer the interior structure. He focuses on using qualitative/direct methods to solve inverse source and shape reconstruction problems which require little to no prior information.